You’ve probably used aloe vera before. After spending one too many hours baking in the sun, you may have have slathered it on your skin, savoring the sweet cooling sensation. Aloe vera can be a sunbather’s best friend. Now, it should be noted that many of the claims made about aloe vera aren’t backed by scientific studies. In this post, we’re only going to include benefits that have at least some scientific backing. Some of the benefits may require more research, but at least initial evidence is in place. We’re going to provide you with 13 other simple, yet powerful ways to use aloe vera. 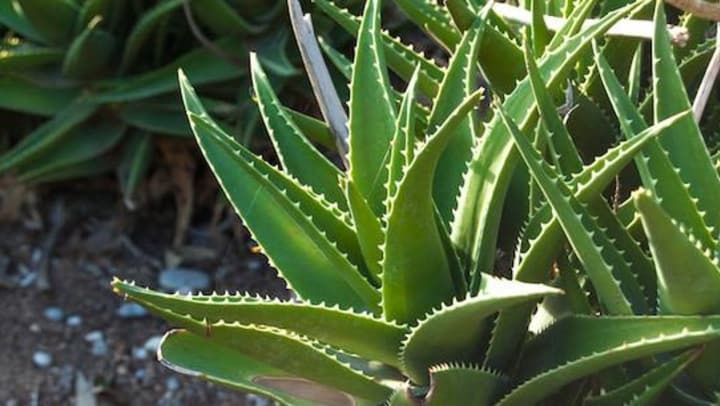 Before we get into uses for aloe vera, let’s quickly talk about the plant itself. It is a plant that grows in tropical climates for both agricultural and medicinal purposes. It typically grows to somewhere between 24-39 inches and has thick, fleshy leaves with a somewhat waxy exterior. Inside, the leaves contain a gel-like liquid. Within this gel are a variety of useful compounds that give the plant its medicinal value, and it has long been valued for its various uses. Now let’s dive into the uses for the plant. It’s well established that antioxidants are incredibly useful for the body. They function as protectors of sorts, attaching themselves to harmful free radicals which can damage cells in the body. The gel within the aloe vera plant contains antioxidants from a family of substances known as polyphenols. The polyphenols, in combination with other compounds, work to inhibit limit the growth of harmful bacteria in the body. Got a nasty case of plaque in your mouth? Let aloe vera come to the rescue. A study of approximately 300 people compared aloe juice to standard mouthwash, which contains the ingredient chlorhexidine. After just 4 days of use, evidence suggested that the aloe vera was just as effective as mouthwash. Given that aloe vera is a natural substance, it can be an outstanding healthy alternative to chemical-laden mouthwash. Of course, aloe vera is useful for treating sunburns, but it has applications beyond that. A study suggested that the plant is effective in treating first and second degree burns, reducing the healing time by as much as 9 days. This is no secret, given that the FDA approved aloe vera as an over-the-counter option for skin burns all the way back in 1959. Despite this, many people assume it’s only use is for treating sunburns. Clogged up from eating the wrong foods? Aloe vera can aid your digestion by acting as a laxative. Surprisingly, it’s not the gel that does this, but the sticky yellow latex found under the skin of the leaf. This latex contains aloin, which has long been established as an effective laxative. However, it should be noted that there have been concerns about using aloe vera as a laxative. Always talk to your doctor before using it. Mouth ulcers, also called canker sores, are painful sores that form in the mouth and often last for a week, or longer. Several studies have indicated that aloe vera is an effective treatment for ulcers, both in speeding the healing and reducing the associated pain. A 7-day study of 180 demonstrated that the plant is effective in reducing the size of ulcers. Another study demonstrated that aloe vera can reduce the significant pain that often comes with canker sores. The jury is still out on this one, given that the research involved was rather poor. However, a few studies suggested that aloe vera might be able to help lower overall blood sugar in diabetics. It does this by enhancing insulin sensitivity and improving the body’s ability to manage sugar. You should definitely speak to your doctor before using aloe vera though as there has been concern about liver damage being caused. Research is still being done, but it appears that aloe vera gel may reduce aging signs on the skin. One study of women over the age of 45 showed that topical use of aloe vera gel could increase collagen production and increase skin elasticity. Another study showed that the gel could minimize redness of the skin. Although it’s still early in the game, these signs are encouraging. The plant has long been used as a home remedy to treat skin rashes and irritation, but evidence also backs this up. A 2009 review of 40 different studies suggested that oral consumption of aloe vera can speed the healing of wounds and decrease the size of growths on the skin. Another study done in 1996 suggested that aloe vera is an effective treatment for psoriasis. A 1996 study done at the Department of Clinical Physiology in Sweden included 60 patients with chronic psoriasis who participated in a randomized, double-blind, controlled trial of aloe vera or placebo cream. The cure rate in the aloe vera group was 83 percent (!) compared to only 7 percent in the placebo group, and there were no relapses reported at the 12-month follow-up. Anyone who has experienced ongoing gastric distress knows the frustration of trying to find relief. Thankfully, aloe vera can provide that relief. One study on rats with gastrointestinal problems found that aloe vera significantly reduced the amount of gastric acid in their bodies. Another study on 30 patients with irritable bowel syndrome discovered that drinking 30 milliliters of aloe vera juice twice per day reduced the overall level of gastric discomfort. Some of these benefits may be due to the laxative and anti-inflammatory properties of aloe vera, as well as the various anti-bacterials. It’s too early to tell, but early research suggests that aloe vera may be able to play some role in slowing the progression of breast cancer. This benefit may be due emodin, which is found in the leaves of the aloe vera plant. Of course, more research must be done to prove this theory, but the evidence is encouraging. The research is limited when it comes to aloe vera’s effect on the cardiovascular system, but the existing research does indicate that the plant may improve overall cardiovascular health. In a study published in the British Medical Journal, researchers suggested that orally administered aloe vera may be helpful in lowering blood lipid levels, which in turn may help regulate cholesterol levels. Considering that cholesterol is typically controlled through taking pharmaceutical drugs, this development is encouraging. Aloe vera can play a role in minimizing dandruff, thanks to its moisturizing properties, anti-inflammatory compounds, anti-fungal properties, and cleansing enzymes. Although additional research is needed to come to a firm conclusion, the evidence suggests that the plant can be an effective remedy. Given that anti-dandruff shampoos have numerous chemicals, this can be an outstanding option. For ways to use aloe vera, read this article. A study from General Dentistry compared aloe vera in tooth gels to standard toothpastes. They found that, in some cases, aloe vera is just as, if not more effective than standard toothpaste. Some of this benefit may be due to the antibacterial compounds found in the plant. Aloe vera is a powerful plant with a variety of uses. As research continues we should expect to see even more uses emerge from the plant, which is certainly encouraging. Given that aloe vera does not contain many of the abrasive, harmful chemicals found in traditional over-the-counter medicines, it should certainly have a place in your medicine cabinet. As noted above, you should consult with your doctor before administering aloe vera. It’s always better to have the advice of an expert.